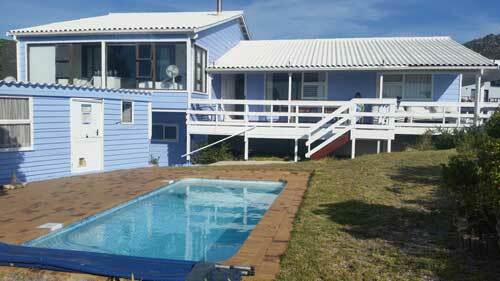 Mermaid's Tail, Pringle Bay offers a relaxing seaside getaway for up to 8 guests. It is set within the charming coastal town of Pringle Bay and is a great option to groups or families visiting this picturesque part of the Western Cape. 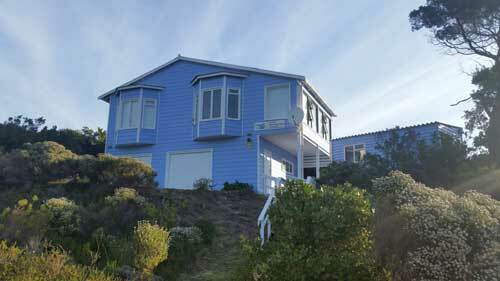 The house is a 10 minute walk (600 metres) to the beach. This Cape Cod-style house has three well-appointed bedrooms and three bathrooms. The living area also has a separate sun room with a queen sized double bed, and views of the sea and swimming pool. The comfortable lounge has a wood-burning heater ideal for those chilly winter nights. The open-plan kitchen is fully equipped and it also has a scullery with a dishwasher. The double garage has ‘boogie’ surf boards, four mountain bikes, fishing equipment, beach games and pool toys. Safety features include a security alarm, smoke detectors, fire extinguishers and a comprehensive first-aid kit. 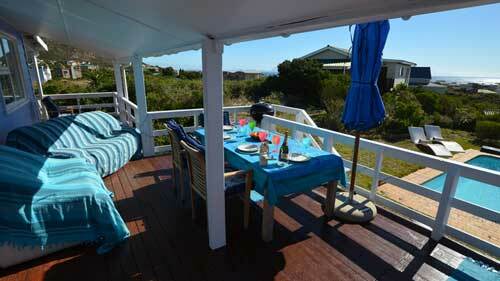 The covered deck offers stunning sea views and a place to enjoy a delicious braai. Visitors can spend their days exploring the beautiful beaches as well as the nearby town attractions. The more active guest can enjoy activities such as mountain biking, surfing and kite surfing. There are three double bedrooms (one can have 2 single beds) with good quality mattresses and white cotton linen, three bathrooms, a lounge with sun-room and an extra single bed in the sun-room, open plan kitchen dining area with a separate scullery. A sheltered timber deck overlooks a sparkling swimming pool, with sea views, perfect for barbecues and sun downers. There is a double garage, equipped with adult & kids boogie boards, two bicycles and two sets of fishing rods and tackle, pool & beach toys. Safety features include a security-linked alarm, smoke detectors, fire extinguishers and a comprehensive first aid kit. The lounge has a wood-burning heater and the bedrooms contain panel heaters for winter and ceiling fans to keep cool in summer. The lounge is equipped with satellite TV and an uncapped wireless internet service. The house is perfect for a relaxing beach holiday. The whole house is available for rent - the floor area is 180 square metres situated in a large wild heather garden of over 2,000 square metres, which attracts numerous local bird species. The owners, Jenny & Paul, live in Cape Town which is one hour's drive away. We have a Malawian housekeeper, Lamson, who works at the house every Monday. He lives nearby and has been provided with a motorcyle so that he is available at short notice to meet you on arrival and to do the check-out on departure on any other days. A comprehensive visitor information booklet for the house is provided to guests, with wi-fi codes, energency numbers, do's and don'ts etc. and Lamsen will show you around the house and facilities on arrival. Pringle Bay is a beautiful seaside village on the edge of the Kogelberg Biosphere Reserve, which is a UNESCO heritage site. The climate is warm and windy in summer and cool overnight in winter, with winter rainfall. Pringle Bay is well located to explore the region's tourist attractions. The Mermaid's Tail is just over one hour's drive from the Cape Town Waterfront & Table Mountain cable-way to the West, and one hour's drive to Hermanus in the East, a very popular whale watching, shark diving and wine tasting area. We have stocked the house with various tourist brochures and there is more tourist information available at the local restaurants and shops - the local residents are very friendly and forthcoming about the attractions of the area. We would recommend hiring a car as the public transport around Pringle Bay is extremely limited. The local mini-bus taxis are not recommended for tourists. Everything in the town of Pringle Bay is within walking distance. It would be feasible to get to Pringle Bay via various airport shuttle services or Uber taxis, but the Uber service does not operate in Pringle Bay itself. OTHER THINGS TO NOTE: The house is 600 metres (660 yards) from the beach and 400 metres (440 yards) from shops and restaurants in the village centre. The area has beautiful beaches, safe for swimming, surfing and kite-surfing with life guards present in summer season. There are numerous mountain walks and bicycle trails close by. There are numerous tourist attractions in the region, including wine tasting, whale watching and shark-cage diving. No smoking in the house please. The area is in the buffer zone of the Kogelberg Biosphere reserve and there is a lot of wild weather around, so bush fires are a danger, so watch those cigarette butts and BBQ fires. The swimming pool is not fenced, but has a cover and pool net available, but for this reason extreme caution needs to be exercised for anyone, especially young children, who can't swim. There is low roof beam on the timber deck, so tall people need to be careful that they do not bump their heads please! Snakes are a potential hazard in Pringle Bay in the bushy areas, mainly in the spring and summer so exercise a keen lookout when walking or hiking in the bush or mountains, and wear hiking boots with ankle protection.